Create fearlessly. Follow your passion. The documentary follows the tumultuous emotional journeys of a handful of intensely-driven dudes as they forced these games into existence, facing adversity at every level-up. The film itself was acclaimed at the Sundance Film Festival and is featured in Possible Worlds, the 2012 Canadian Film Festival in Sydney at the Dendy. The feature was inspired by a short film about Alec Holowka of Infinite Ammo. Yes go watch that too. 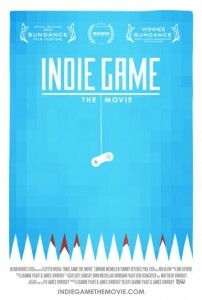 In a twist of feel-good indie fate that is so perfect that a froth of conspiracy theorists will surely claim it was concocted by an evil PR firm for an old media kiretsu to lull us indie game fans into a false sense of disruptive innovation, the film project was hatched and funded on Kickstarter. They hoped for at least $15k but actually raised just under $25k from nearly 300 backers pledging anything from $1, garnering thanks, to over $300 in exchange for (amongst the special edition merch) having one’s own video game trailer tastefully appended to the movie! The games include indie hits Super Meat Boy with plentry of hearty platform carnage, painterly time-puzzle platformer Braid and Minecraft Notch’s recent obsession, the 3D crypto-twister Fez. If you’re in Sydney you can get a festival ticket for $16 (includes a free drink) and not only watch the movie, but see the video games first-hand as they will be set up to play. If, however, you don’t drink/live in Sydney/want to be seen in public, you can get an even cheaper fix as a digital download direct from the filmmakers. Just like buying a cassette from the back of an artist’s car. Does this make you want to be an indie game developer? Are video games Art? Are we witnessing an indie games renaissance? What do you think of the movie? Previously featured: Kickstarter video game pitch for Double Fine Adventure and Neal Stephenson’s project. I love computers that have their model name written in huge sausage lettering. But they MUST have blinking lights. Furthermore, I love standing next to them in a lab coat and a Mr. Spock haircut. Get your nerd on. This is a still from the ponderous 70s AI thriller “Collossus – The Forbin Project”. The plot evolves creatively toward the somewhat inevitable madness arising from putting computers in charge of “solving” the cold war. Oh, kids, the cold war was just a big non-war back in the good old days when there was one big enemy.